Indonesia sarongs bali factory. We're sarongs factory located in Bali Indonesia. Batik sarongs supplier. We're sarong factory in Bali Indonesia. We're producer and export company. We're also wholesale company. We manufacture and export many kind of sarongs from Bali. Batik sarongs supplier and exporter with years of experience in making batik pareo and sarong fabrics. We have extensive range of batik sarongs and pareo. All handmade in Bali by skill batik craftsmen. 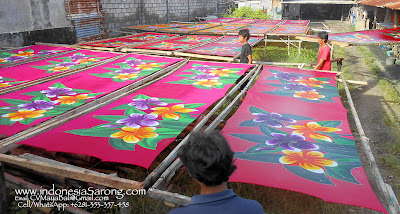 Rayon fabric is our main materials to use as sarongs pareos. Place your sarongs order using our shopping cart or send us email with your order in details. Tell us product code/sarong number, color, quantity per code etc. Please try to be as details as possible. Tell us also your shipping port or your complete address with zip code. Don't forget to inform how we should send your order whether by sea freight or air freight. Once you email us your order, we would compose your proforma invoice with shipping charge included. You're also welcome to arrange shipping your self. You're free to look around for the best freight company for your shipment. After you approve our proforma invoice, we require you to send us deposit by wire transfer to our bank account in amount of 30 to 50% of total order. 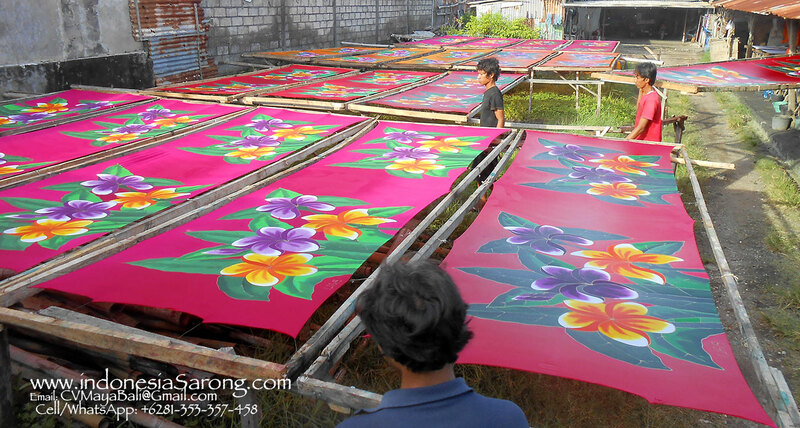 During production of your sarongs order, you're welcome to monitor our sarong production process. Before mass production of the sarong pareo we will email you or send by courier the samples if necessary. If color of the Bali sarongs need to be precise, please don't forget to send us your fabric color swatch by express courier. After your batik sarongs order completed, we will notify you and ask you or your freight company to check your sarongs pareo. After you satisfy with your sarongs pareo, please wire transfer the remaining payment. After we receive your wire transfer, we then ask your freight company to pick up the beach sarongs order. Price only include sarong and basic packaging. 10 pieces of sarongs in plastic bags. 100 pieces of sarongs in one carton box. No label. No printed marking. We sell our sarongs pareo from Bali in IDR (Indonesian Rupiah). We converted our price into US$ or other currency (Euro, AU$, YEN etc) based on market exchange rate and this is subject to change. It is your responsibility to investigate with your freight company in your country about any taxes, tariffs or duty involved in importing Bali batik sarongs pareo from Indonesia. It is our main priority to make sure you receive your Bali sarongs in timely manner. Please try to order as early as possible. Our production time frame is around 1 to 2 months.